We’ve all read the breathless accounts of the ways technology is going to be integrated into the supply chain — from ordering materials, to manufacturing, to delivery. But many of those predictions of integrating supply chain technology won’t be the norm for years. Supply chain managers, sourcing and procurement professionals are looking for real solutions for today, not years from now. That was one finding researchers at Kenco Innovation Labs discovered after surveying industry professionals to find out whether wholesale adoption of new technologies was taking place. For starters, the survey respondents said that they were looking for ways technology could simplify or streamline business processes rather than investing in the latest gadget or building a drone hive. They're looking for much more practical solutions. 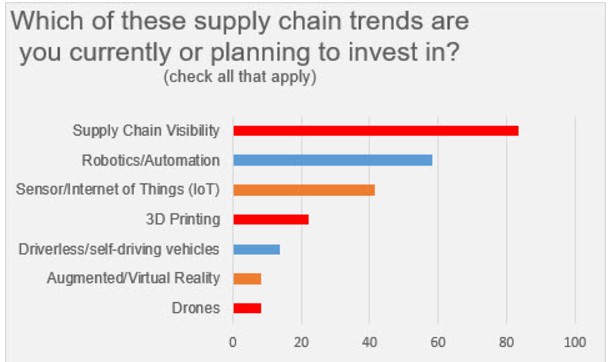 The top answer to the question “Which of these supply chain trends are you currently or planning to invest in” was “Supply Chain Visibility.” And by a wide margin (see chart). Drones, AR/VR and autonomous vehicles barely make the radar. The most widely used and "proven technology" that will put you on the path to achieving what most business leaders say is their no. 1 goal, has been available for years. Enterprise Resource Planning (ERP) software is a good first step companies can take when looking to begin the march toward integrating technology into their supply chain. It's easy to understand why. 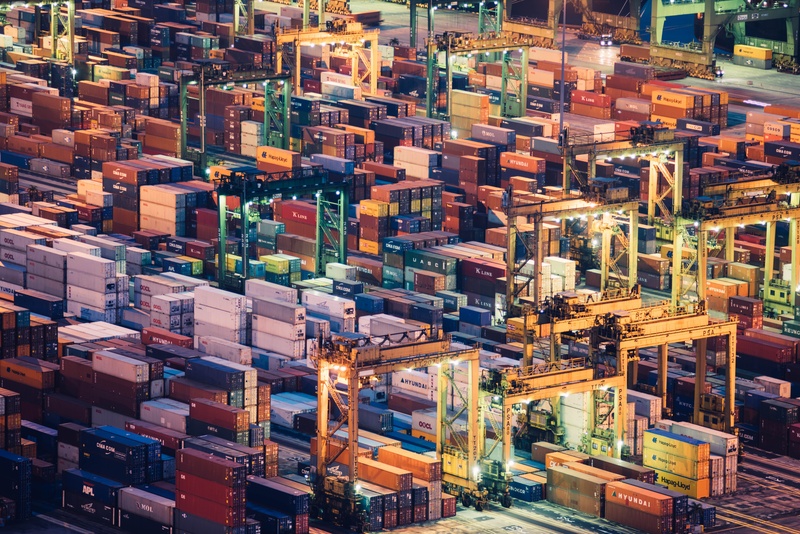 When you're dealing with multiple suppliers and partners, ERP tools manage all aspects of the supply chain — everything from ordering raw materials and inventory control to tracking, shipping and logistics, allowing for true supply chain visibility. If you're thinking, doesn't everyone already use ERP software? The answer is a resounding "NO." But here's the kicker: Despite those percentages, the survey showed that a significant number of the respondents — 48 percent — were still using traditional, non-cloud-based methods (i.e. phone calls, faxes and email) to complete transactions with suppliers. So it's not that business leaders don't know that ERP software will help them their SCM goals, they're just not ready to pull the trigger. Anyone else find that surprising? Okay, okay, you're saying. I know I should check out some tech solutions to help me manage my supply chain. What do I do now? Know what you're looking for. Do you want an on-site or cloud-based ERP system? What about mobile device accessibility? Make a list of the things you want to be able to do, process-wise. Check to see if there's industry-specific ERP software you can use. Get recommendations from people you know and trust. Are you involved in an industry association? Ask around. Check out the product. Draw up a pro vs. con list before you decide. Check references. A reputable ERP provider will have references you can check out. We always recommend getting at least three references. Obtain buy-in. Make sure everyone, especially upper management, is on the same page and keep them in the loop. They don't have to know the nitty gritty, but they do need to be aware in the event of implementation hiccups. Don't rush implementation. Make sure you've got one person who has taken on the role of managing the implementation and education for employees. This is a process that will take time and effort. There is a learning curve. Backup your ERP data, in fact, maintain dual backups. Take full and incremental backups of all your network files. Backup your servers in the event you need to rebuild it quickly. Maintain up-to-date firewalls. Make sure you've got the most recent updates. Protect your network with malware software. Don't forget to protect your company cellphones or other mobile devices that can connect to your ERP. One thing is for sure, technology isn't going to integrate itself into your business all by itself. Processes are becoming more automated, not less. The time to move is now. You don't want to be the last guy wondering how to flip the switch.